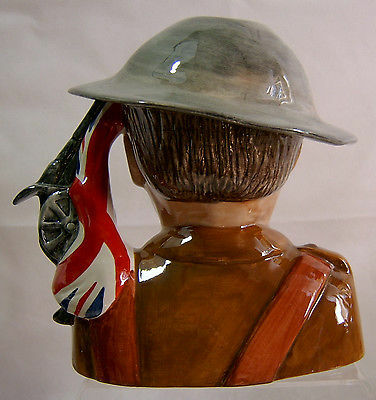 Created by Bairstow Manor Collectables, this marvellous Toby Jug is now available in limited numbers. 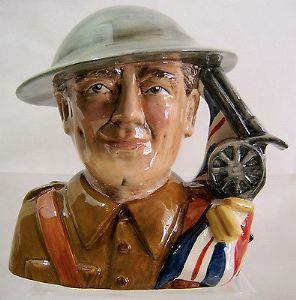 As can be clearly noted, the Toby Jug represents an image of the British WWI War Veteran, so many of whom fought and died 100 years ago. The Toby Jug captures the essence of the futility of sending so many to their death, fighting against impossible odds . This one is a Prototype issue (a very small number is always prepared for selected clients prior to general release) from a new limited edition. 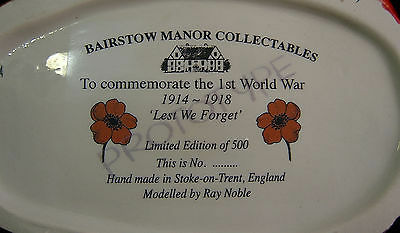 It measures 7 inches (18 cms) in height and 7.25 inches (18.5 cms) in width. Ii is appropriately backstamped with the images of the Red Poppy , together with with full detals of those concerned with its manufacture. Notwithstanding, I c an provide further photos if required.